Toronto FC has turfed one of its supporters groups after an investigation into fans setting fires with flares at a Canadian Championship game in Ottawa. 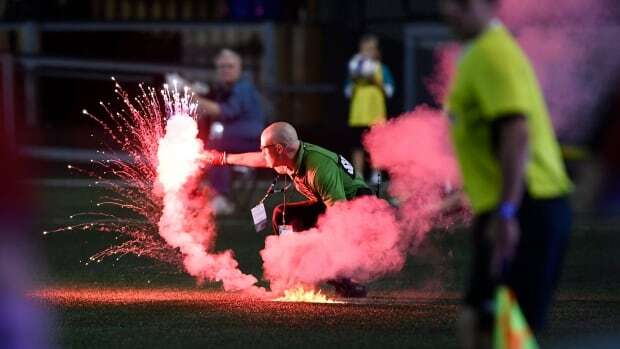 Flares and smoke bombs led to small fires in the stands and the pitch at TD Place in the July 18 match. The so-called Inebriatti supporters' group eventually took responsibility, saying the incidents — while not acceptable — were "unplanned and accidental." The MLS club said an investigation by the club and Ottawa police confirmed that Inebriatti members had smuggled in "prohibited pyrotechnic devices." As a result, the soccer club has terminated Inebriatti's status as an official supporters group and refunded all tickets associated with the group. Inebriatti members will be prohibited from entering the south end and supporters section of BMO Field until they have completed the online MLS Fan Conduct Education Class at their own expense. The club said several individuals have also been banned from BMO Field and MLSE-owned properties indefinitely. The ban includes members of Inebriatti and non-members.